A graduate of the University of Cincinnati with a B.S. in design, with post graduate work at the Arts Academy of Cincinnati and the University of Oxford Ohio, artist Claudia Hopf has published four books on Scherenschnitte, two of them pattern books. Her work has been exhibited in galleries and shows from the East coast to California. Her work hangs in the Library of Congress and is represented in collections in France, Germany, Switzerland, Africa, England, Australia, and Canada. Claudia became interested in the craft of Scherenschnitte when she was in Pennsylvania where husband Carroll was director of the Pennsylvania Farm Museum of Landis Valley. 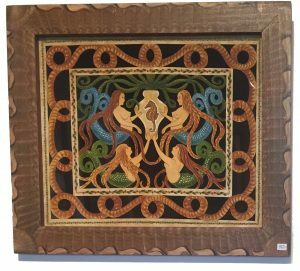 Although she had been interested in many crafts and processes, she became so intrigued with a Scherenschnitte birth certificate that came to the museum, that she learned the skill and has devoted herself to the art full time since 1967. Each tiny leaf and thin stem is hand cut and hand painted in the intricate designs of Claudia Hopf’s Scherenschnitte, the art of painted paper cutwork. A favorite pet, animals of all kinds, flowers, people doing everyday things, can be the focus for the picture Claudia skillfully creates or it can be a document of a special event such as a birth or marriage certificate. Each Scherenschnitte begins with Claudia drawing the design of the scene, which can be of any size. Perry, Claudia and Carroll Hopf’s son, then uses surgical scissors for the actual intricate cutwork carefully snipping around each detail in the picture. It then goes back to Claudia for painting. 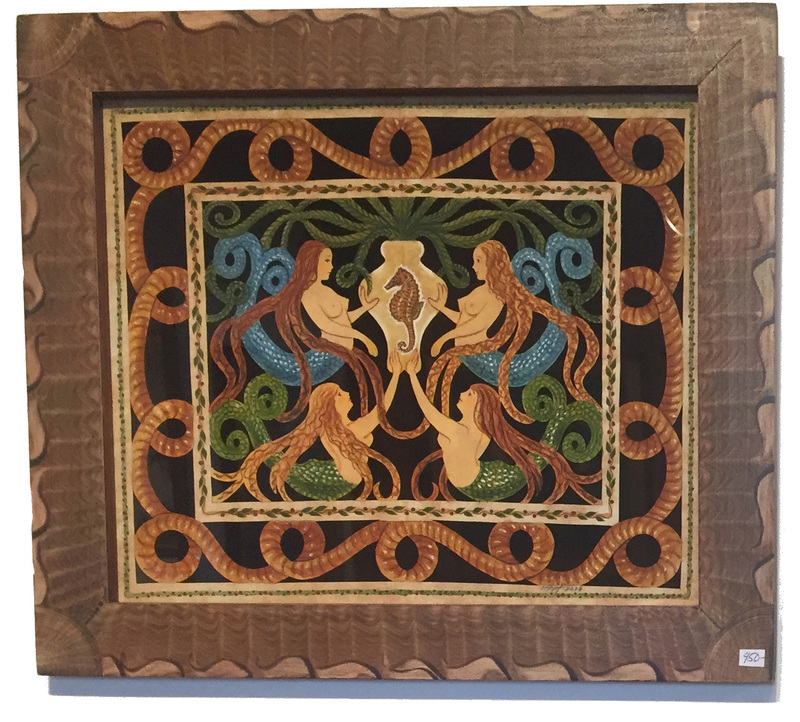 Placed against a black background, the finished design is framed by Carroll, in one of his grain-painted wood frames. The crafts of the Hopfs were a feature of Country Home Magazine, April 1998, Early American Life, August 1988, Country Home’s Folkcrafts, June 1994 and Country Living, December 1996. Each frame is 1.5” wide.